""Womens Skins A200 mock necks are an ideal choice of compression base layer top for the sports enthusiast, gym user or fitness runner. 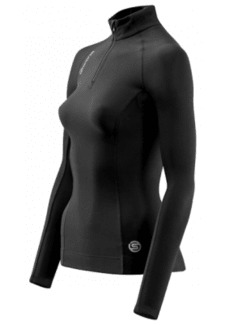 These womens compression tops have the benefit of a zipper at the higher neck which makes for a more versatile garment. The technical properties of A200 womens compression mock offer you the high quality and performance that you would expect from Skins. The Skins A200 womans zip mock benefits from the improvements Skins have developed in the A200 compression series. The natural successor to Skins She compression apparel, the A200 women compression series are aesthetically attractive, excellent value and functionally accomplished items of compression clothing with an added emphasis on the fit and style elements. Womens A200 compression mock with zipper feature denser seam stitching and see the introduction of a new, soft mesh for increased ventilation and stretch also help distinguish the ladies A200 mock top as a compression garment of superior standard. The Skins A200 series of compression clothing is the replacement for the hugely successful Skins Sport and Skins She ranges. The Skins compression A200 line retains many of the original qualities that made this range so popular such as gradient compression, muscle wrapping seams and UV sun protection and incorporate enhancements in specification and design.""